Do you get the blues in December? Traditional December birthstones are all beautiful blues, turquoise and blue zircon. But these gems are often hard to find in fine jewelry, leaving December babies crying the blues instead. The non-profit association that represents the North American gem industry, the American Gem Trade Association, in cooperation with other industry associations decided to do something about this lack of December choices. In 2002, the AGTA officially added tanzanite to the traditional list of birthstones for the month of December, building upon the tradition for beautiful blue gems. Because tanzanite was only discovered in 1969, it never had a chance to be included in the official birthstone list, which was created in 1912. 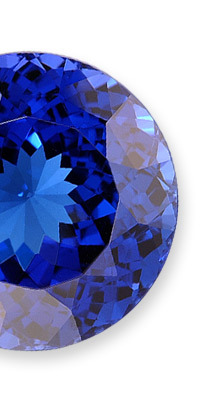 Today, however, tanzanite is by far the most popular blue gemstone after sapphire. Tanzanite, the ultimate prize of a gem safari, has a mesmerizing blend of rich purples and blues with a velvety deepness of color unlike any other gem. Mined in Tanzania at the feet of the majestic Mount Kilimanjaro, Tanzanite is found only in a five square mile area in the hills of Merelani, ten miles south of the Kilimanjaro International Airport, between Moshi and Arusha. After mining, virtually every tanzanite is heated to permanently change its color from brown to the spectacular violet-blue color for which this precious gemstone variety is known. With the growing popularity of tanzanite, adding it to the traditional list of birthstones can only increase the desire for this blue beauty. And also increase the gem appreciation of those December babies.